This book introduces readers to the symbolic images of three Singapore Chinese temples built in the Hokkien architectural-style more than a hundred years ago. Each of the texts explains the meaning, mythology, setting and materials behind the symbolism of the design elements found in the temples. 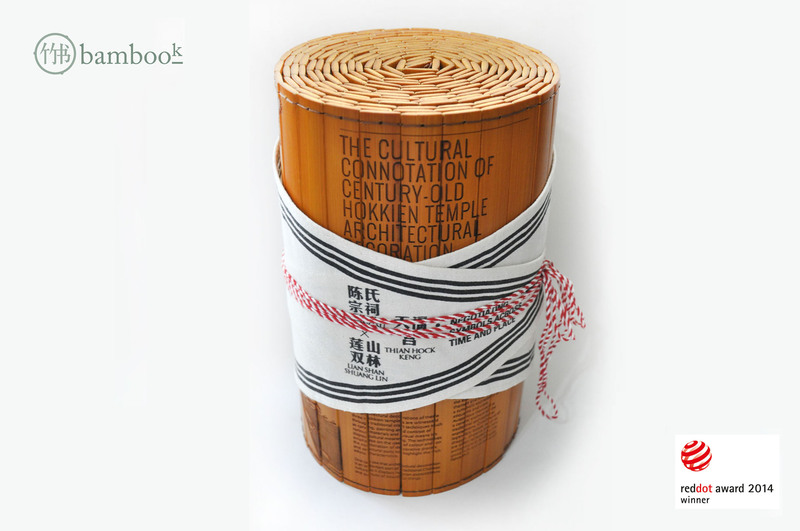 It is designed as a traditional bamboo scroll because it allows for the depiction of a continuous narrative, viewing it is a progression through time and space. This presentation enhances the value of the cultural images presented in the book. The architectural forms of Hokkien monastic tradition are meticulous as they are symbolic, naturally embedded with numerous design elements. Three of such century-old Hokkien temples in Singapore – Thian Hock Keng, Siong Lim Sian See, Tan Si Chong Su, embody such qualities, and have arguably served as cornerstones for their more contemporary counterparts. Largely obscured by history, a hypothetical understanding of such qualities provokes a methodical approach to discerning their design considerations. A cross-examination between the three would also allow the understanding of stylistic changes in relation to evolving historical circumstances. This project is therefore a marriage of the visual and the contextual, in pursuit of contemporary design insights. In view of scarcity of relevant literature, much of the aforementioned documentation procedures are crucial in maintaining a consistent resource for a study of design elements contained within. The use of this resource could be extended to purposes, which transcend that of this report. Since comprehensive documentation and categorisation would resolve questions concerning context, symbolism and aesthetics, a cross comparison would spell an expanded contextual analysis upon the subject. Especially pertinent to the field of art and design history, this process would essentially map the progress of Hokkien temple design from 1842–1902. Currently, comprehensive archival documentation of the architecture and design of these temples is scarce. This inhibits a referential comparison between them, and so a physical, photographic documentation must first be performed. Furthermore, while there is considerable information surrounding dominant and generic features, the more obscure design elements that might be innovations of Hokkien or Singaporean tradition, are left largely undocumented. Another crucial consideration lies in the fact that these temples have seen substantial restructuring, renovation and restoration over their long histories. It is thus important to review the motivations behind such developments, together with those of the designs in their original conceptions. In comparing century old Hokkien temples, one might expect an evolution of style and a development of representational technique. Yet the progression of design sensibilities is far from linear or simple, but rather a complex interweaving of subtle to pronounced differences in aesthetic, material and location. It can then be said that each temple is unique in its own right, and there is no clear evidence to suggest that they might have influenced each other. One could even go as far as to conclude that no two categories of design elements across the three temples are exactly the same. Given this, it is still relatively easy to draw a parallel between counterparts, meaning to say that each design element could be easily catalogued into its respective category and sub-category. This is due to the fact that the design elements are adequately recognisable due to key features in their designs. Of course, such would require an equally adequate understanding of historical, cultural and symbolic backgrounds. This understanding also relates to the fact that the design of these elements stem from the same visual, cultural and symbolic vocabulary, that is, Southern Chinese Fujian style. The three temples and more importantly the design elements contained within are bound by a common philosophy, and despite the aesthetic and formal differences (which stems from a varied spectrum of creative intentions), are akin to one another. They all echo the spiritual and symbolic content of the same religious beliefs which are communicated visually through a distinctively Hokkien aesthetic. My plan for future research would be to explore and present the cultures and civilisations of Asia, so as to promote awareness and appreciation of the ancestral cultures of Singaporeans and their links to Southeast Asia and the world. Still focusing on Hokkien culture, my future research will explore the rich and complicated historical connections between the Fujian (Hokkien) province in China and Singapore, focusing on the needs and goals of this connection in technological contexts.